Children with autism have many more brain cells than typically developing children, researchers have found, supporting previous research that suggests that autism may be caused by something going awry before a baby is born as opposed to something triggering autism in a toddler. Scientists studied the brains of 13 boys and found those with autism had 67% more brain cells than typically developing boys. They specifically looked at the part of the brain called the prefrontal cortex because it's the part that's responsible for social, emotional, communication and language development. Having too many neurons or nerve cells in the part of the brain that controls the very features that children with autism struggle with may explain the origin of autism, the study suggests. "In autism something is going terribly wrong with mechanisms that control the number of neurons beginning in prenatal life and may extend to perinatal and early post-natal life," says lead author Eric Courchesne, Ph.D. When there are too many brain cells, the brain can't wire itself up correctly. If there's too much wiring in the prefrontal cortex, it could help explain why children with autism have poor social skills, difficulty communicating and why some may never learn to speak at all. In addition to finding too many brain cells, Courchesne and his colleagues found the brains of children with autism were heavier than those of typically developed children. "The brains of boys with autism were 17.6% heavier than controls. It wasn't as big as would be predicted based on the neuron count alone," says Courchesne. He adds that he would have predicted those brains to be maybe 30% heavier than a normally developing brain. He acknowledges that this raises more questions than it answers, which is why more research like this needs to be done. Even though this is only a very small study – the brains of seven boys with autism and six boys without were analyzed – this research is being seen as quite important because this study looked at the brains of boys between the ages of 2 and 16. Previous studies included brain samples from older individuals, with severe autism and other mental disabilities. Determining how many neurons are in the brain can be done only after somebody has died, Courchesne explains, and there simply aren't that many samples of brains from children available. The brain samples for this research came from children who had died from drowning or other accidents. There are only two parts of the brain where neurons are generated after birth – in the hippocampus and in the olfactory bulb. Because this study looked at a part of the brain where all the neurons are generated before the a baby is born, the findings add significantly to the mounting biological evidence that autism develops before birth in "some, possibly all, cases," according to an accompanying editorial in the Journal of the American Medical Association, which published the research on Tuesday. Courchesne says that neurons or nerve cells really start developing in the prefrontal cortex at the end of the first trimester of pregnancy. Between the 10th and 20th week of gestation, the number of fetal brain cells grow from maybe hundreds of thousands to more than 20 billion in a part of the brain that doesn't exist in lower mammals. He also says that the brain produces about 20 billion more cells that help the growth of another layer in the brain, but that those extra cells are supposed to die towards the end of a pregnancy. So increased nerve cells in the prefrontal cortex or brain overgrowth or maybe a combination of both may contribute to autism. This isn't the first study to suggest brain size or overgrowth play a role in autism. "These new results, along with an earlier study reporting altered wiring of the prefrontal cortex, focus our attention on this critical area of the brain in autism, according to Dr. Thomas Insel, the director of the National Institute of Mental Health. The NIMH, which is a part of the National Institutes of Health, supports the University of California- San Diego Autism Center of Excellence, where Courchesne conducts his research. 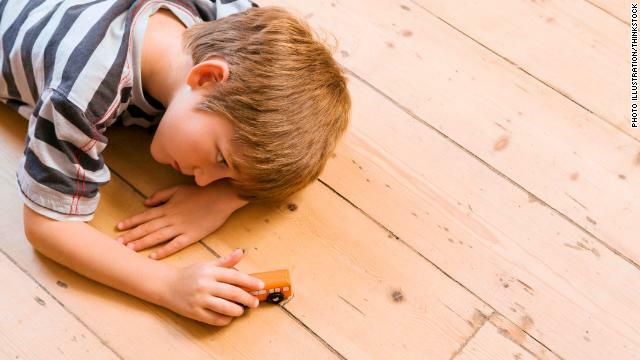 "This is a good example where you have too much of a good thing, it can be bad for you," says Dr. Max Wiznitzer, a neurologist and autism expert at the Rainbow Babies and Children's Hospital in Cleveland, Ohio. He likens the brain to an assembly line with too many workers (brain cells) sitting around. And when you have too many workers on the line, they can interfere with one another rather than contribute to the factory's (or brain's) productivity. Wiznitzer agrees that even though this is a small study, it's consistent with previous research. "It's groundbreaking [even though] it doesn't give us a clear answer," says Dr. Jeremy Veenstra-Vanderweele, an autism researcher at the Vanderbilt Kennedy Center. He says this research is "significant because it narrows the window during development when autism-related brain abnormalities emerge." All of the experts agree the reason that too many nerve cells exist is not yet known. This study suggests it might be the excess number of nerve cells or the excess brain size that is linked to autism, or it might be a combination of both. But since the excess neurons were found in a part of the brain that develops before a child is born, it points to a prenatal problem playing a role in autism. "This is not consistent with that claims that heavy metals [from vaccines for example] cause the death of brain cells," says Wiznitzer, because there are too many brain cells not less. The authors of the editorial suggest that this study along with previous brain studies and recent advances in genetics, imaging, neuropathology, animal models, and epidemiology "autism research is at last turning a corner." « Previous entryAre school soda bans effective? Google Fragile X Syndrome and learn. Sometimes it makes me wonder.... could this be a next step in evolution.. I agree that Autism probably does start in the womb. However, I would just like to make people of aware of a study that link anti-depressant (SSRI's specifically) use during pregnancy and before. In the study, people who took anti-depressants before pregnancy where 2 TIMES MORE LIKELY to have children with autism. If they took SSRI's during pregnancy, the chances of having and autistic child was 4. Now, I think that is news, CNN, MSNBC, FOX buried the story with in a day. There was also a study done on rats exposed to SSRI's in the womb. The outcomes where similar (the rat brains and behavoirs). Please excuse the spelling and grammar errors above. Hi SharkSHark. I have a four year old who is autistic and I never took meds during my pregnancy. But I did come across a study that suggested that mothers who suffered from mental disroders, such as depression, bipolar disorders, and things like that had a higher chance of having a child with autism. Do you think it is the mothers mental status and not necessarily the medication she is taking? Just a thought. I am in the medical field and you wouldnt beleive how many women are on SSRI's . If there was a sure fire link, I believe there would be alot more autistic children. What do you think? There is so much studies out there, It is very overwhelming! Could increased stress hormones such as cortisol the mother might have experienced during pregnancy somehow increase number of neurons in the fetus?? Cortisol levels can increase with lack of sleep. Autism may be miss claimed, since there is a sytemic ligament problem, that may have all sorts of different reactions, especially with undiagnosed children, It can effect the heart, which has gone undiagnosed congenital heart valve ligament problems. but this is not limited to the heart only. Usually also with eyesight problems, and maybe even all this thyroid problems, and related to double jointedness. The children find it hard and confusing, until diagnosed, THE SOCIAL WORKERS REFUSE TO AKNOWLEDGE THEY MAY HAVE BEEN VERY WRONG FOR A LONG PERIOD OF TIME, IN DRUGGING ALL THIS CHILDRFEN NO LESS WITH STIMULANTS AND DEPRESSANTS, THAT THEY DO AND DID NOT CARE EVEN WHICH DRUG WAS USED. JUST TO GET THEM ON DRUGS, WHICH APPEARS TO BE VERY LUCRATIVE FOR THE SOCIAL WORKERS. Well..that make sense today since the medical ma.....have started to vaccinating pregnant woman and the flu shoot contain highest amount of mercury of all vaccines.. I think it is irresponsible to put weight into a study that compared 6 children to 7 other children and found a 67% percent difference. Sure, it seems like a large difference, but in those tiny numbers, how is that statistically significant or not something that easily could have happened by chance? I'm the father of 2 autistic boys so I try to keep up to date on the subject. With regard to your comment "I believe there would be alot more autistic children...", the rate of autism was 1 in 50 but the CDC just changed that to 1 in 68 (I think). That's about 75,000 new cases in children per year. Medical studies and textbooks from 30 years ago report a rate of about 1 in 5,000 (I've seen as high as 1 in 1000 and as low as 1 in 10,000). The increase in the autism rate coencides pretty closely with the introduction of SSRI's. My wife took SSRIs before her first pregnancy.